Youth Administrator of the Year - Neil McNab, Jr. The deadline to submit rule and bylaw change proposals has passed. Please review the proposed changes below. Click here to review the passed/failed rule changes. If you have any questions, please email Suzanne Donahue at sdonahue@georgiasoccer.org. Daniel is the current Player Athlete Director. Sean Meadows is the current President of Tucker Youth Soccer Association. He has served this club as President since November 2017. Prior to this role, he was the VicePresident of TYSA’s Recreation program for 3 years. He has served on the Board for TYSA for 7 years. He coached Rec soccer for many years on both the Girl’s and Boy’s programs. He is also a referee. Sean has 2 children that play for TYSA in their Academy and Select Program. Wilkes, 13, plays on the TYSA 05 Boys team. Addison, 11, plays on the TYSA 06 Girls team. Addison also participates in Atlanta United’s Regional Development School. Professionally, Sean is a Registered Respiratory Therapist and is credentialed in Asthma Education, COPD education and Tobacco Intervention. He currently works for INSMED Biopharmaceuticals and manages the North Georgia area in the promotional of inhaled antibiotics for the treatment of rare lung diseases. He as won awards from the American Lung Association for the development and implementation of an asthma educational program for school aged kids during summer camps. Sean combines his clinical, technical and business expertise to be successful in his career and volunteer roles. His focus is in process improvements and analytics to ensure efficiency in TYSA’s soccer product. Richard is the President of ADASL and has served on the Board for one year as the Player Athlete Director. Andy has worked on the Recreational committee for years. JR Kenny has a unique blend of corporate and non-profit experience with a distinctive ability to execute complex strategies for fortune 500 companies, state governments and community based organizations. In his current role as the Director, Government Relations (NE) at Boys & Girls Clubs of America (BGCA), JR works with over 180 Boys & Girls Clubs developing comprehensive plans raising awareness and building stronger relationships with elected officials. Before moving into his current role at BGCA, he held positions including Senior Director, Planning and Administration, and Account Director, Corporate Partnerships, securing over $20M in corporate partnerships. Prior to joining the Boys & Girls Clubs of America, JR led the southeast regional marketing activations for Fiat Chrysler Automobiles, executing 40-50 events a year and driving awareness and purchase consideration for the brand. JR started his career as the marketing manager at the GINN Open, a LPGA golf tournament, executing a comprehensive marketing plan and managing corporate partner relationships. JR earned his MBA and Master, Sports Business Management from the DeVos Sports Business Management program at the University of Central Florida. He graduated with a BA in Communications from the University of Kentucky, where he was on the varsity soccer team helping them to an appearance in the NCAA tournament and ending the season ranked #23 nationally. He began his college career at UAB, helping the soccer team to a Sweet 16 appearance and #12 national ranking. Growing up in Marietta, GA, he attended Lassiter High School and was named to all-state and all-county teams his junior and senior years. He holds a National D coaching license. A native of Marietta, Ga, I grew up playing for various clubs across Georgia. I began playing for Metro North Youth Soccer Association, then transitioned to United Quest, Concorde Fire, Forsyth Fusion, Cherokee Redwings, and finally NASA. I played under my father, Neil Bloom, at Lassiter High School before earning a scholarship to play at Berry College in Rome, Georgia. As a starter for all four years, I became team captain and the team MVP and graduated with a Kinesiology degree. I then moved on to sign my first professional contract with AC St. Louis in the NASL. After one year, I then signed for the Charlotte eagles for two seasons who at the time played in the USL. Then after a short stint back in the NASL with the Atlanta Silverbacks, I was purchased by Toronto FC in the MLS and went on to play four seasons in Toronto. I was then traded through the expansion draft to Atlanta United for their inaugural season. Then, I went to Vancouver FC for a very brief stint before retiring from professional soccer. I have since began my second career serving as a financial advisor with Edward Jones. Dean is a representative of Atlanta United who would like to serve on the Georgia Soccer Board to enable a smooth relationship between the two partners. I was born in Germany and am passionate about the game of soccer (I played soccer and rugby most of my young adulthood, but have now been relegated to the cheering section!). I am an attorney who attended Brown University and Baylor Law School and have lived here in Cobb County, GA for the past 12 years with my wife, three daughters, and two mastiffs. One of our daughters plays soccer at the U15 level; her club team plays in the US Youth Soccer National League and she has been with ODP for the past two years. My wife is currently the admin for the 2004 Girls ODP team. I previously served on the board of the Roswell Santos Soccer Club (although we no longer have any affiliation with that organization), as well as the boards of the Georgia Symphony Orchestra and the Adaptive Learning Center. I am very familiar with the challenges and opportunities of non-profit board work and believe I will able to assist with the issues arising with Georgia Soccer. Professionally, I have advised global companies my entire career, first as external counsel and most recently from the general counsel seat. I have experience advising boards, executive leadership and and staff members on a variety of legal topics, including contract law, employment law, regulatory interpretation, claims and disputes, tax, and contract management. I would welcome the opportunity to bring this professional expertise to the sport I love and serve Georgia Soccer as an independent director. Steve is the current President. I am originally from Mexico but grew up in Dallas Texas. I have been involved in soccer for many years. I played soccer throughout my high school years and for a few years afterwards. In the early 1980s I began coaching youth soccer in Dallas Tx at a local YMCA, a few years later I was the assistant coach for a youth premier soccer team that was part of one of Dallas’ first soccer leagues. The team was one of the first teams in the Dallas area to travel and play internationally. In 1998 I began coaching my son Marcos at Cobb FC. While at Cobb FC I held many roles, Member of the Board of Directors, Rec Commissioner, and Vice President of the club. I have been coaching at the Cobb YMCA since the fall 2009. Until October 2015 I was the Director of the Cobb YMCA Select program. Currently I am member of the Georgia State Soccer Association board of directors. I am also member of the NW YMCA advisory board and have served as a board member of directors. When I am not at the soccer fields I work at General Electric. My wife Marie and I have two children, Marcos (23) played soccer up until he went to college, and Ashlee (17) she currently plays. Besides my children and soccer, digital photography is my other passion. Adam Beckman grew up in Atlanta, Georgia, where he participated in Georgia Youth Soccer at United Quest and Concorde. A 2001 graduate of Pope High School, Adam went on to participate in the University of Georgia Honors Program, where he graduated from the Terry College of Business with a degree in Economics. In 2003, Adam began his coaching career at Oconee County High School. For the last 13 years he has coached at Riverwood High School, and helped lead the team to a State Championship in 2016. He has spent the last 3 seasons coaching at Smyrna Soccer Club. Currently, he coaches the U13 Boys National League team. Outside of soccer, Adam has spent his entire professional career as a banker. His career began with BB&T, where he spent 13 years, and recently, he transitioned to a new role as a Senior Vice President in the ServisFirst Bank Commercial & Corporate Banking division. During his career, he has managed and originated over a billion dollars in commercial real estate transactions, participated in mergers and acquisitions, and led innovative targeted marketing campaigns to reach underserved segments of the Georgia community. He also served as a Director on the BB&T Diversity & Inclusion Committee. His community leadership positions have included serving on boards with the Marcus Jewish Community Center; as Executive Director of the Vince Dooley Tribute; and as President of Tau Epsilon Phi Fraternity. Delroy is the current Vice President - Youth. Nominations from the floor will not be permitted, with the exception of vacancies that are created during the Annual General Meeting. 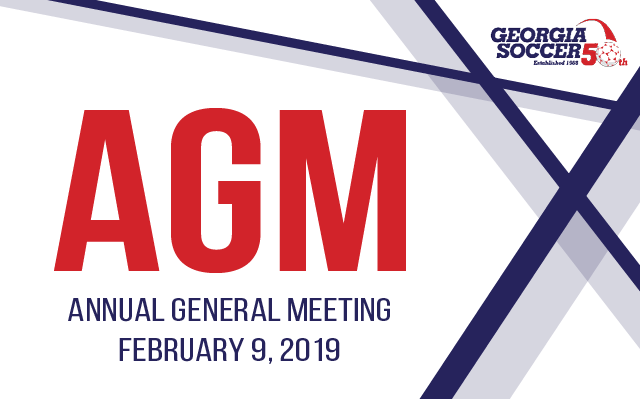 Nominations will be presented for election at the Annual General Meeting on February 9, 2019. Click here for descriptions of all Board of Directors positions.